I used to hate planning. It felt unnatural and forced. Life felt like less of a grand adventure. I enjoyed the thrill of spontaneity, improvisation, and watching things naturally fall into place. For a while, this approach worked. I did things that interested me and opportunities fell into my lap. I felt in touch with the flow of life. But then a point came when life stopped moving as smoothly. I found myself spread too thin, spending my time and energy on things that didn’t matter. I knew the work and purpose I was meant to birth into this world. But I wasn’t focusing on it. This felt devastating. Going with the flow had led me to say “yes” to everything except my own interests and needs. A few months ago, I decided to focus all of my energy on changing this. I began refining the foundation of who I am and what I bring into the world. 3) What would you do for free? My immediate visceral responses were writing, helping others make positive personal changes, and inspiring people to do the things that inspire them. Aha! This is what I was meant to be working on. What’s most important to you? What makes you happy? What would you do for free? 2. Let go of the things that don’t serve you. Our best self feels energized, alive, and like contribution and progress are being made. With this in mind, I took a close look at my life and all of the things that I was doing. For each activity, I asked myself, does X… energize me? Help me move my priorities forward? Provide opportunities for learning and growth? Play a positive role in my life? These questions shed light on what I needed to change. I ended side projects that weren’t aligned with my purpose, left New York, cut out alcohol, and let go of acquaintances who sucked my energy. I moved to Boulder, drank more water and herbal tea, started working with a personal trainer, and surrounded myself with a tight-knit group of people who challenge me, share values, and make me feel like the best me. What (or who) is no longer serving you? How can you let go? 3. Commit to three priorities. Jim Colins says that if you have more than three priorities than you don’t have any at all. Taking his advice, I picked three areas of focus: 1) Hey Amber Rae (writing), 2) Passion Experiment (helping people make positive personal changes), 3) revolution.is (stories that inspire meaningful action). The thought of working on only these things deeply excited me. That’s when I knew I was on the right path. What are your three priorities? 4. Create a schedule structure that works best for you. 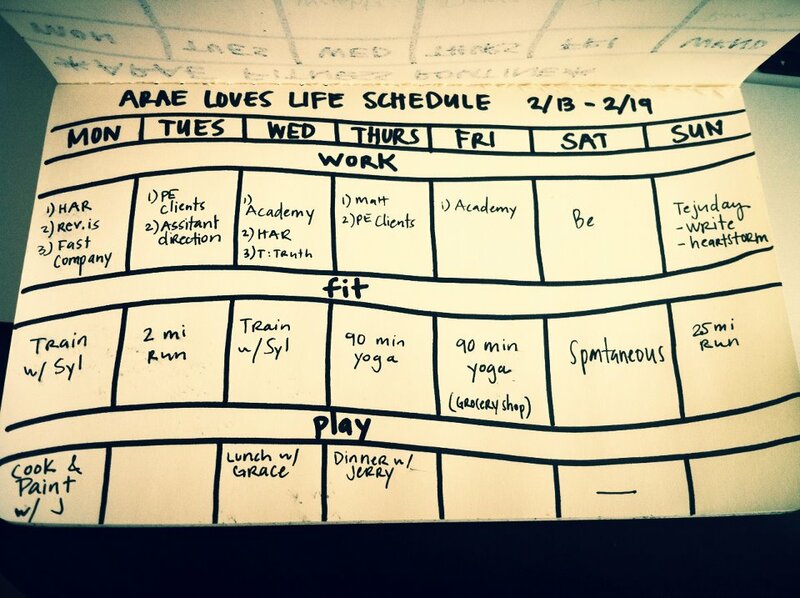 Inspired by Paul Graham’s “Makers schedule,” I structured my life so that I could be as creative and productive as possible. Being creative is about giving my brain the space to make more connections. When I have appointments all day, I lose that space. I use Tuesday and Thursday for clients and appointments. Monday, Wednesday, and Friday are “Amber Days.” This means zero appointments and my entire day is open for what I want to work on and do. How can you restucture your schedule to give you space for creation? What isn’t working about your current schedule? How can you create blocks of time to make it work for you? Based on my priorities and promises, every Sunday, I map out a week that gets me excited. I feel the most inspired when I do good work, am active, and include play. That’s why I created a work / fit / play framework. > Work. I have no more than 3 priorities each day. I map the priorities based on T/Th for clients and M/W/F for Amber. > Fit. I make sure to do some form of exercise every day (and working with a trainer has totally changed my life). This gives me a surge of energy each day and helps my brain make creative connections. > Play. Every day, I make time for play. (The play calendar wasn’t complete when I took this picture.) Play typically involves spending time with someone I care about and doing something creative or new. (For example, on Monday, I painted and cooked with a friend.) I also work in weekly “heartstorming” play dates with friends who make my heart and brain feel on fire. > Schedule spontaneity. I love adventure, randomness, and the unknown. That’s why I leave Saturday open to whatever comes my way. It definitely keeps things interesting. All in all, if you want to do work that matters, if you want to prioritize your purpose and continually build momentum toward it, you’ll need to plan your life accordingly. Life doesn’t happen to us. Life works with us when we learn how to work it. p.s. - Heart this post? Tweet it! p.p.s - if you implement any of the above and it works for you, please tell me your story! I’d love to hear about your positive changes. They’ll make my day. -- Thanks to James and Michael for inspiring this post and Nathaniel and Antonio for reading the draft. 1. Women possess strong communication skills and social intelligence. These are essential skills to have, especially in a world where so many modes of communication and interaction are available. 2. Women make good listeners, and are strong at drawing people into their conversations. To women, building a business is like building a team. 3. Women collaborate - on just about everything! From examples such as joint trips to the restroom to a 2009 Times article, women exercise a transformational leadership style that is very well-suited for today's flattening hierarchies in start-ups. 4. Women prefer lower risk, prioritizing work along with personal harmony - leading to fulfilling professional and personal lives. The flip side is that men's businesses are, on average, larger than women-owned businesses. So the question goes back to - where is that elusive balance? And how do you find the right one on your own terms? Keep your eyes out for YWiB's upcoming launch of an exciting new offering, which we hope will provide a platform for women to explore these questions further. Thank you to Jeremy Lim for the photo of our lovely YWiB ladies included as part of this article. YWiB has something cooking...check back regularly for more hints and clues! The deadline for applying to volunteer with YWiB has been extended to October 31st. This is to accommodate for our newsletter going out later than we expected to members annoucning the opening of the positions. Please see here for information on applying! Thank you to everyone who has already applied - we will be in touch soon if we already haven't! YWiB Helps PWN Celebrate 15 Years! September 29th marked the 15th Anniversary Celebration of the Professional Women’s Network (PWN). Founded and chaired by YWiB Advisor, Michelle Pockey (whom we love! ), YWiB was extremely excited to volunteer at the event and support these amazing women who have supported us! The theme of the evening was to recall the past and celebrate the future of professional women. The keynote address (and the highlight of our evening!) was given by Anne Lippert (President, Consulting and Advisory Services) and our very own Paulina and Jen! Anne shared stories of her experiences in starting out in the working world. The proverbial glass ceiling was very much a reality in her time. After being told countless times that ‘women were not management material’, Anne fought to be recognized as an equal and was one of the first women in BC to participate in a trial program at RBC to train women managers. She provided incredible perspective on how much change has occurred. Paulina and Jen followed with exciting stories of young women who are following their passions and pioneering new paths. The stories were of friends seeking opportunities for exploration, for making and impact, and for starting something new. Using a metaphor of ‘crayons’, Paulina and Jen explained that the options for professional women have grown from a ‘small pack of 12 colors’ to over 120 in the box. Their ‘call to action’ for all women present was to ask and invite young women to sit at the table. Exposing young women to all the crayons will help them find their favourite color, and to continue to add more crayon colors to the box. A big hug and heartfelt CONGRATULATIONS to Michelle and PWN! And an even bigger THANK YOU to all the women and men who were honoured for their contributions to helping us all to keep on growing, exploring and excelling. for the full press release on The International Alliance of Women 2011 Awards, click here. As we sometimes find it quite confusing at times to know where as a young women, do I fit into the picture of women business networks, we thought we would compile a list and share it. We hope that it would be as valuable a resource to you as it is to us. Please note that the list below are women business networks and is still a work in progress. Please also feel free to share additional women business networks that we might have missed out! 1) Association of Women in Finance: dedicated to promoting women in finance‐related industries by encouraging their advancement, development and involvement in the business community. 2) Association of Women Business Owners: to support and encourage women in business through regular dinner meetings held at The Terminal City Club with topical presentations from leading speakers and business people that can offer practical and applicable business ideas to help your business grow and prosper. 3) Canada’s Most Powerful Women: Top 100: these awards honour women who are proven achievers in the private, public and not‐for‐profit sectors. 4) The Connected Woman: a professional resource network for women executives and entrepreneurs who desire to participate in an organization that is all about the reciprocal process of exchanging knowledge, experience and expertise. 5) eWomen Network: the fastest growing international membership‐based professional women’s promotional and networking organization in North America. We offer women of all occupations and professions new opportunities to transact business with one another and to leverage collective purchasing power. 6) Forum for Women Entrepreneurs: to mentor and educate women entrepreneurs through leading‐edge professional programs and to facilitate connections within the business community. 8 ) Ladies Who Launch: offers women a supportive environment in which to explore making their dreams – whether writing a book, launching a new business, switching careers, or starting a social cause – a reality. 9) Momcafe: to provide a forum to connect and inspire women. Through meetings, seminars and internet‐based communication tools, we bring positive and inspiring role models to speak to momcafé. 11) The Minerva Foundation for BC Women: inspire and empower women and girls to reach their full potential by creating opportunities and offering programs through trusted partnerships in the areas of education, leadership development, economic security, and safety. 12) Valley Women’s Network: dedicated to bringing together women from all walks of life so that they may share and support each other’s goals and interests, exchange ideas, and encourage both learning from their peers and set a good example for others. 13) Westcoast Moms: two distinct online communities with a moms perspective on the world and celebrating motherhood with a West Coast flair. 14) Women of Whistler: to provide an opportunity for Whistler businesswomen to network, gain knowledge and share ideas in a friendly, relaxed environment. 15) Women’s Enterprise Centre: BC’s leading resource for women entrepreneurs, offering skills development, business loans, free business guidance, business resources, mentoring, networking and events! 16) Wired Women: to create an environment that encourages women to explore opportunities in technology, science and new media and to build successful careers that will allow them to become a driving force in these expanding sectors. 17) Women’s Executive Network: creates and delivers innovative networking, mentoring, professional and personal development to support and recognize executive‐minded women and their organizations in the pursuit of excellence. 18) Women’s Leadership Circle: designed to deliver programs, speakers, topics and other events that will enable The Board of Trade be more engaged with women in the community and to help women feel more engaged with The Board. 20) Young Executives for Success: women make new and powerful connections with other women at our events and they also have a positive impact on the lives of disadvantaged women in our community through support of Dress for Success. 21) YWiB: to connect young women with the resources and support to achieve success on their own terms and to become engaged members in their communities.